The challenge : Photo inspired food. This Sunday Challenge, I was given the assignment to come up with a meal inspired by a photo. Here is the photo that my husband chose. My thought: I loved this challenge. How I interpret the photo and selection of the ingreditents are all up to me and you can be really creative. I usually trust my very first instinct or idea that comes to mind. In this case, the beautiful green at the bottom would be represented by a dark pea puree, and the clouds by a light and fluffy souffle. For the lightning I first imagined using a spun sugar stick, but since I wanted to make something savory that would go well with the other items that I was thinking to make, I decided to use parmesan cheese chips that I made several times before. I still needed to decide the main protein but after my decision of all the sides, it was almost automatic - lamb. And since the photo was from Australia, the lamb was an especially appropriate choice. 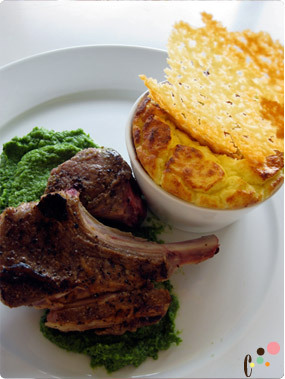 Because of the lamb, I made the pea puree with lots of mint and basil for color and taste. I really had fun with this. Judge's verdict: I was really impressed by this dish visually. It depicted each of the main components of the photo in such a creative way, and yet they all went together both visually and culinarily. 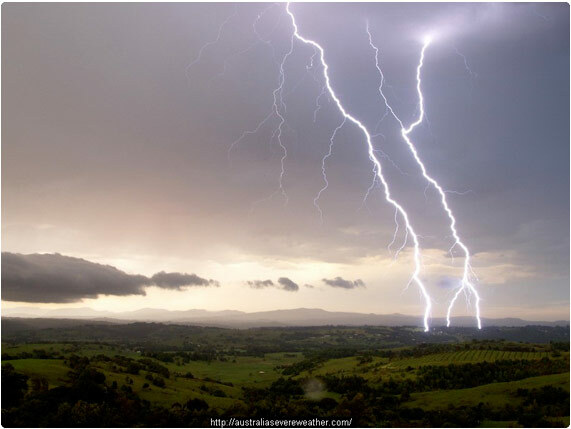 I really was seeing and tasting a photo of an Australian thunderstorm. Not only did the colors match, but the dish managed to capture in three dimensions what the photo could only represent in two. Then there was the taste. Lamb is one of my favorites and this was cooked perfectly, as was the savory, rich and fluffy (as a cloud!) souffle. The parmesan added the texture and the pea puree had a surprising kick from the mint. This probably wins the prize for the best Sunday challenge so far.